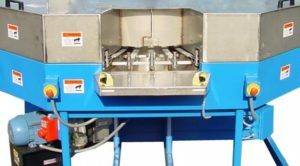 The Indexing Turntable Parts Washer is a compact aqueous spray cleaning machine designed for one piece at a time part washing. Parts are loaded by robot or by hand onto a rotating fixture which indexes on a timed cycle from three seconds and up. Parts index into high pressure spray zones which remove machining chips and oils while cleaning out small holes and passages.